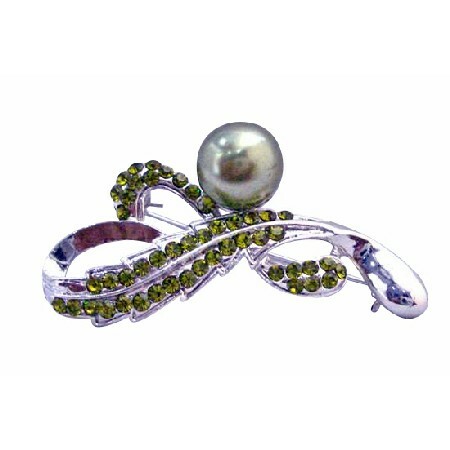 Give every ensemble a feminine touch sophisticated Brooch made with Excellent workmanship Sparkling Flowers on The 10mm Green Pearls surrounded with Olivine Crystals on the Silver Metal Framed absolutely for Wedding cake Bridesmaid Bridal Brooch or dress brooch or for bidal party it enhance the beauty. Artistically Silver Casting fully decorated with Crystals PearlsVERY Sleek Dainty & Sophisticate. Add a dash of drama with a bold eye-catching brooch. This is lovely brooch on your favorite dress shirt scarf or jacket lapel. A beautiful accessory for any occasion. Secures with a standard pin clasp. A great gift idea or an addition to your jewel collection. Pretty & feminine describes this vintage Brooch & excellent crafted Very Elegant.